There are so many toys on the market to select from sometimes it can be overwhelming on what brand to pick and what types of toys to buy. My son loves make believe play. He can play for hours with his "guys" ("guys" are the action figure toys he has). He makes them fight, jump, fly, talk and dance. I have been looking for a toy that he can have as the hub of where his action heroes could play. Little girls have doll houses and little boys do not have many cool options. When I found the Hape Discovery Space Center toy online at ImagineToys.com I was thrilled to have an answer to a cool toy for my son. My son can be rough with his toys and a few plastic toys did not survive a week in our house. The Discovery Space Center is made of wood with non toxic paint and very durable. He has pushed it over when there was a "monster alien attack" he has thrown the little space ship that launches from the top when it was blasting off and it has all stayed intact. I love to encourage his imagination with toys like this one. He can make up little stories as to what adventures are happening. The toy is very interactive with a pulley system elevator, 3 astronauts, an alien and four levels of space center activities. We are planning a trip to a Discovery Space Center Museum locally and this is a great way to introduce the topic to my son in a fun way. He is learning and playing at the same time. Imagine Toys has many wonderful options when it comes to Pretend Play toys. I think kids need more toys like this to help with their creativity development and story telling skills. To celebrate the Spring and to encourage you to buy Pretend Play toys for your kids this summer when school is out we are hosting a giveaway for 1 lucky winner to win a Discovery Space Center for your own child or grandchild. *Limited to US residents 18 years old and above. Giveaway starts April 16 2013 and ends on May 7, 2013 at 12:01 am EST. Winner will be emailed and has 72 hours to respond before another winner is selected. I was not paid for this giveaway or post. The opinions on this item are 100% mine and may vary from others. The sponsor is responsible for providing the prize. I was sent a product to review for this post. This is adorable! 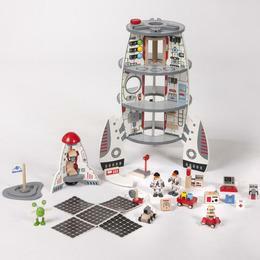 My son would absolutely love this because he is really into rocket ships. I guess most little boys would love this too! My son would also love Dino Island from their website. My grandson would like to have the ABC Wordpad! I think the A Cuppa Joe is super fun! My boys would also like the Jay Jay the Jet Plane Control Tower! Oh Carter would also love the Dino Island! My daughter would flip over this. She's really interested in anything about space. She would also like their Harvest Barn playset. My son would love the Home Sweet Tent! Jungle Animal Hospital, Magical Play Castle, Plasma car, and many more! My grandson would like Marble Mania Extreme 2.0. The Genetics & DNA set would be a fabulous gift for my oldest. Dino Island would be fun! We'd also like the Little Town Blocks and the Little Town Friends. My daughter would love the Mighty Mixer for her kitchen. The dino island would be fun! My great nephew would love this! I think my grandkids would like the rock and rolla doggie ride on. The Bay the 10 inch horse!!! My kids would also love the Home Sweet Tent! How cute!